If your child has just been sorted into the Hufflepuff House at the prestigious Hogwarts School of Witchcraft and Wizardry, then congratulations! The namesake house of Helga Hufflepuff - one of the four famous founders of Hogwarts - Hufflepuffs value hard work, patience, loyalty, and fair play. They're also often known as the nicest, kindest, and thus most popular students in school! Their house animal, the badger, symbolizes the Hufflepuff's traditional hallmarks of outstanding work ethic and constancy, and their cheerful house colors of bee yellow and black signify their friendly and helpful natures. But don't let all that niceness fool you: Some of the most amazing brains in the wizarding world have also come from Hufflepuff. For instance, Newt Scamander, author of "Fantastic Beasts and Where to Find Them" was sorted into the house that Helga built! Not a bad legacy to carry on, eh? 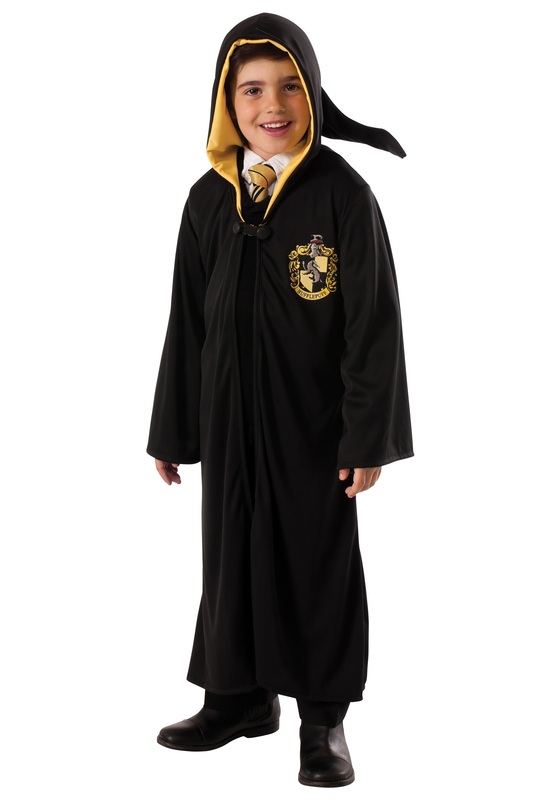 And if your child is representing Hufflepuff, then this Child Hufflepuff Robe is a wardrobe requirement! The black hooded robe (there's also yellow in the interior of the hood!) will keep them warm when they're rushing from Potions to The Care & Feeding of Magical Creatures. The clasp in front of the robe will keep the robe on even when they're practicing their Quiddich skills. The Hufflepuff symbol on the left side will let them wear their house crest with pride (hey, that rhymes!). With this Child Hufflepuff Robe, your child is certain to earn all of the points for Hufflepuff House! The material is thin but it has very few threads hanging but besides that it's amazing!